Light Turquoise Glacier Blue combines a stunning color play of light turquoise, peridot and violet. Glacier Blue is a special effect custom coating and variations will occur. 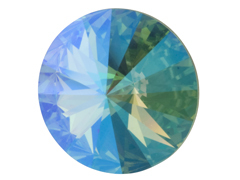 The base Light Turquoise component is manufactured by Swarovski and the Glacier Blue finish is an after market coating not applied by Swarovski. This product was added to our catalog on Tuesday July 23, 2013.